In recent years, the cost of heating your house, whether via gas, electricity or oil, has risen considerably. Fuel prices are set to continue to rise, so if you’re set on lowering or economising on the cost of heating your home, then now is as good a time as many to act on it. Woodburning stoves are fast becoming one of the most efficient ways to save money on fuel bills. Where an open fire is only 20-30% efficient at heating a room, a woodburning stove will operate at around 80% efficiency, as standard. Although there are a vast number of makes and models on the market, a good solid woodburning stove in room could save you around 30% off your fuel bill in the first year. So for an annual fuel bill of around £600, you could save at least £200. There are two main costs that you’ll have to incur when installing your woodburning stove. The first is, of course, your woodburning stove. Prices range from cheap stoves at around £200 (but you should expect much less efficiency), with mid-range stoves typically priced around the £600 mark. High-end, super-efficient ‘clean burning’ stoves retail at around £800-£2000 and the very best, most efficient designer multi-fuel stoves can cost as much as £6000. Second-hand stoves are also worth looking into, but do your research beforehand to find the best woodburning stove for your budget. Woodburning stoves can’t be used in smokeless zones, although there are a number of stoves deemed ‘clean’ enough that can be now installed – but may cost a little more to buy. To install your woodburning stove, you’ll need a chimney that will be able to cope with the output of heat, as well as a flue installed as a liner to protect the chimney against heat and wood tar. If you don’t have a chimney, you may be able to have your flue installed via a twin wall system. This will probably require specialist services to ensure it meets buildings and fire regulations. The cost of installing your woodburning stove will, of course, vary on what work needs doing to the chimney and fireplace, but expect to spend at least £200-500. The good news is that using a mid-range stove in an average-sized home could see you recouping your initial costs within 2-4 years, saving you a significant amount of money on your fuel bills from thereon. You could boost these results by properly insulating your home, meaning that less central heating from gas, electricity or oil is required to heat the rest of the house. 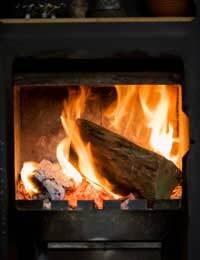 Some woodburning stove systems can become part of a larger backboiler system, heating other radiators and hot water sources in the house, thereby increasing the likelihood of saving more money over a longer period of time - but the time over which it will take to recoup the initial costs will be longer. Wood is deemed a sustainable source of energy, as whilst the trees grow, they output oxygen, and feed upon carbon dioxide. In fact, the dying roots of a tree will output the same or more carbon dioxide as burning the wood, so are considered super-green. The best woods to burn for increased efficiency are hard woods, as they are denser and take longer to burn, and often have a greater heat output. If you want to keep the cost of burning fuel to a minimum, it’s worth asking around at local joineries or saw mills for off-cuts of wood. Alternatively, new ‘eco logs’ are now produced from waste wood at saw mills, compressed into super-dense, super-efficient logs that can take around 1-2 hours to burn, with a greater heat output than standard hardwoods. These can be bought from fuel suppliers, farm shops or online, and if bought in bulk ultimately prove a frugal and efficient way to heat your home. Another source of low-cost (virtually free!) fuel is local woodland areas, where fallen wood can be gathered. If you’re tempted by this option, make sure that you leave some rotting and dead wood behind, as it is a vital habitat and food source for many of our native wildlife species. You’ll also have to check in the nooks and crannies of your gathered wood for creepy crawlies, to ensure that they don’t meet a grim end in your stove! Will a Water Metre Save You Money?